Add a touch of vintage luxury to your home or garden with this stylish and functional set. Looking for a unique gift for a friend or relative who loves gardening or just vintage/farmhouse decor? 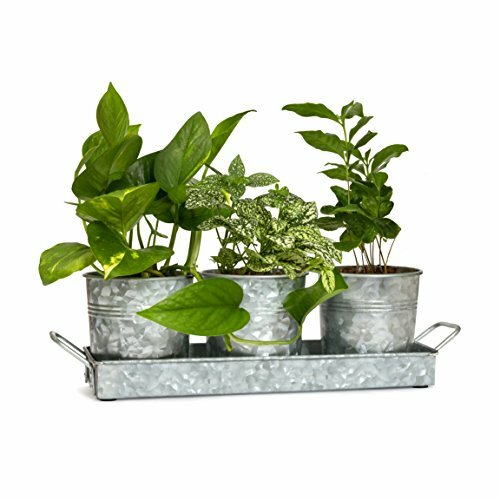 Quality design points: drain holes in pots for herbs, succulents, plants and flowers, durable 4-point connected handles, quality pads on the underside of tray. .27 thick galvanized metal with vintage finish. Dimensions(in): Tray with handle: 15.6in wide x 2in high x 3.9in deep. (12.9in wide x 1.4in high x 3.9in deep base) Pots: 4.1in high, 4.1in wide top, 3.4in wide bottom. Set weight 1.05lb. Dimensions(cm): Tray with handle: 39.5cm wide x 5.0cm high x 9.8 cm deep. (32.7cm wide x 3.5cm high x 9.8cm deep base) Pots: 10.5cm high, 10.5cm wide top, 8.7cm wide bottom. Set weight .48 kg. Why Choose The Walford Home Garden Pots & Caddy Set? Want To Make Your Home or Garden Look More Elegant & Beautiful? Here's The Quick & Easy Way! FARMHOUSE DECOR. Elegant pot and tray will make your home or garden look straight from a home décor magazine! Perfect as a picnic, craft or silverware kitchen caddy. ONE PRODUCT, UNLIMITED USES! Perfect windowsill planter. Ideal for herbs, succulents, or flowers. Beautiful as a wedding decoration or centerpiece. Great for organization and storage. SUPERIOR QUALITY WITH ATTENTION TO DETAIL. The durable, heavy-duty galvanized steel is sturdy and weather resistant. Quality 4-point connected handles. Premium protective pads on tray underside. YOUR SATISFACTION IS OUR #1 PRIORITY, If after 30 days if you're not 100% thrilled with their beautiful design and unparalleled versatility, we promise to offer you a prompt and full refund. Dimensions(in): Tray and handle: 15.6in wide x 2in high x 3.9in deep. (Tray base: 12.9in wide x 1.4in high x 3.9in deep) Pots: 4.1in high, 4.1in wide top, 3.4in wide bottom. Set weight 1.05lb. If you have any questions about this product by Walford Home, contact us by completing and submitting the form below. If you are looking for a specif part number, please include it with your message.